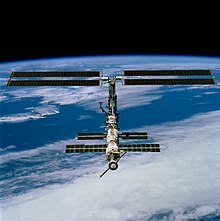 The ISS is the ninth space station to be inhabited by crews, following the Soviet and later Russian Salyut, Almaz, and Mir stations as well as Skylab from the US. 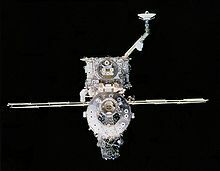 The station has been continuously occupied for 18 years and 171 days since the arrival of Expedition 1 on 2 November 2000. 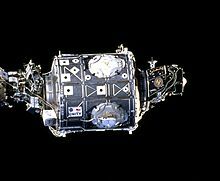 This is the longest continuous human presence in low Earth orbit, having surpassed the previous record of 9 years and 357 days held by Mir. It has been visited by astronauts, cosmonauts and space tourists from 18 different nations. After the American Space Shuttle programme ended in 2011, Soyuz rockets became the only provider of transport for astronauts at the ISS. ^ Clark, Stephen (13 December 2016). 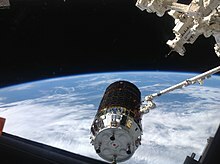 "Japanese HTV makes battery delivery to International Space Station". Spaceflight Now. Retrieved 29 January 2017. ^ Patterson, Michael J. (1998). 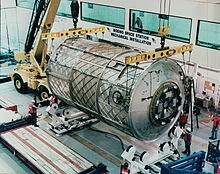 "Cathodes Delivered for Space Station Plasma Contactor System". Research & Technology. NASA / Lewis Research Center. TM-1999-208815. Archived from the original on 5 July 2011. ^ Price, Steve; Phillips, Tony; Knier, Gil (21 March 2001). "Staying Cool on the ISS". NASA. Retrieved 22 July 2016. ^ ATCS Team Overview. (PDF). Retrieved 8 October 2011. ^ a b "Communications and Tracking". Boeing. Archived from the original on 11 June 2008. Retrieved 30 November 2009. ^ Mathews, Melissa; James Hartsfield (25 March 2005). "International Space Station Status Report: SS05-015". NASA News. NASA. Retrieved 11 January 2010. ^ Harland, David (30 November 2004). 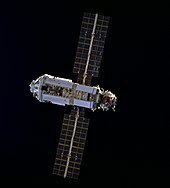 The Story of Space Station Mir. New York: Springer-Verlag New York Inc. ISBN 978-0-387-23011-5. ^ Harvey, Brian (2007). The rebirth of the Russian space program: 50 years after Sputnik, new frontiers. Springer Praxis Books. p. 263. ISBN 978-0-387-71354-0. ^ Anatoly Zak (4 January 2010). "Space exploration in 2011". RussianSpaceWeb. Archived from the original on 26 June 2010. Retrieved 12 January 2010. 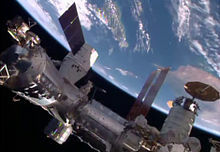 ^ "ISS On-Orbit Status 05/02/10". NASA. 2 May 2010. Retrieved 7 July 2010. 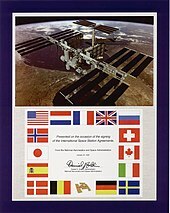 ^ "Memorandum of Understanding Between the National Aeronautics and Space Administration of the United States of America and the Government of Japan Concerning Cooperation on the Civil International Space Station". NASA. 24 February 1998. Retrieved 19 April 2009. ^ "Operations Local Area Network (OPS LAN) Interface Control Document" (PDF). NASA. February 2000. Retrieved 30 November 2009. ^ "ISS/ATV communication system flight on Soyuz". EADS Astrium. 28 February 2005. Retrieved 30 November 2009. ^ Chris Bergin (10 November 2009). "STS-129 ready to support Dragon communication demo with ISS". NASASpaceflight.com. Retrieved 30 November 2009. ^ Heath, Nick (23 May 2016). "From Windows 10, Linux, iPads, iPhones to HoloLens: The tech astronauts use on the ISS". TechRepublic. Retrieved 29 June 2018. ^ Bilton, Nick (22 January 2010). "First Tweet From Space". The New York Times. Retrieved 29 April 2014. ^ Smith, Will (19 October 2012). "How Fast is the ISS's Internet? (and Other Space Questions Answered)". Tested.com. Retrieved 29 April 2014. ^ Zell, Martin; Suenson, Rosita (13 August 2013). "ESA ISS Science & System - Operations Status Report #150 Increment 36: 13-26 July 2013". European Space Agency. Retrieved 11 July 2018. ^ Burt, Julie (1 June 2001). "Computer problems overcome during STS-100" (PDF). Space Center Roundup. NASA. Archived from the original (PDF) on 23 December 2016. Retrieved 11 July 2018. ^ Malik, Tariq (14 June 2007). "NASA: Space Station Computer Crash May Extend Shuttle Mission". Space.com. Retrieved 11 July 2018. ^ Klotz, Irene (13 June 2007). "NASA battles failure of space station computer". Reuters. Retrieved 11 July 2018. ^ Klotz, Irene (22 May 2017). "NASA Plans Emergency Spacewalk To Replace Key Computer On International Space Station". Huffpost. Retrieved 11 July 2018. ^ Thomson, Iain (10 May 2013). "Penguins in spa-a-a-ce! ISS dumps Windows for Linux on laptops". The Register. Retrieved 15 May 2013. ^ Gunter, Joel (10 May 2013). "International Space Station to boldly go with Linux over Windows". The Daily Telegraph. Retrieved 15 May 2013. ^ "International Space Station Expeditions". NASA. 10 April 2009. Retrieved 13 April 2009. ^ NASA (2008). "International Space Station". NASA. Retrieved 22 October 2008. ^ Morring, Frank (27 July 2012). "ISS Research Hampered By Crew Availability". Aviation Week. Archived from the original on 1 May 2013. Retrieved 30 July 2012. A commercial capability would allow the station's crew to grow from six to seven by providing a four-seat vehicle for emergency departures in addition to the three-seat Russian Soyuz capsules in use today. ^ Hoversten, Paul (1 May 2011). "Assembly (Nearly) Complete". Air & Space Magazine. Retrieved 8 May 2011. In fact, we're designed on the U.S. side to take four crew. The ISS design is actually for seven. We operate with six because first, we can get all our work done with six, and second, we don't have a vehicle that allows us to fly a seventh crew member. Our requirement for the new vehicles being designed is for four seats. So I don't expect us to go down in crew size. I would expect us to increase it. ^ "Biographies of USSR/Russian Cosmonauts: Padalka". Spacefacts. Archived from the original on 6 September 2017. Retrieved 28 January 2018. ^ "Biographies of U.S. Astronauts: Whitson". Spacefacts. Archived from the original on 28 January 2018. Retrieved 28 January 2018. ^ Schwartz, John (10 October 2008). "Russia Leads Way in Space Tourism With Paid Trips into Orbit". The New York Times. ^ Boyle, Alan. "Space passenger Olsen to pull his own weight". MSNBC. ^ "Flight to space ignited dreams | St. Catharines Standard". Stcatharinesstandard.ca. Archived from the original on 12 September 2012. Retrieved 1 May 2012. ^ "ESA – Human Spaceflight and Exploration – Business – "I am NOT a tourist"". Esa.int. 18 September 2006. Retrieved 1 May 2012. ^ "Interview with Anousheh Ansari, the First Female Space Tourist". Space.com. 15 September 2006. Retrieved 1 May 2012. ^ "Breaking News | Resumption of Soyuz tourist flights announced". Spaceflight Now. Retrieved 1 May 2012. ^ Maher, Heather (15 September 2006). "U.S.: Iranian-American To Be First Female Civilian in Space". Radio Free Europe/Radio Liberty. Retrieved 1 May 2012. ^ "Space Tourists | A Film By Christian Frei". 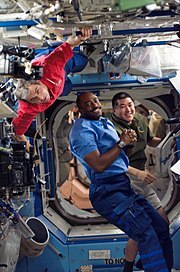 Space-tourists-film.com. Retrieved 1 May 2012. ^ Cook, John (29 August 2011). "From outer space to the ocean floor, Geocaching.com now boasts more than 1.5 million hidden treasures". Geekwire.com. Retrieved 27 February 2013. ^ "American game designer follows father into orbit". ABC News. 12 October 2008. Retrieved 16 May 2016. ^ Pelt, Michel van (2009). Into the Solar System on a String : Space Tethers and Space Elevators (1st ed.). New York, NY: Springer New York. p. 133. ISBN 978-0-387-76555-6. ^ "Europe's ATV-2 departs ISS to make way for Russia's Progress M-11M". NASASpaceFlight.com. 20 June 2011. Retrieved 1 May 2012. ^ Rand Simberg (29 July 2008). "The Uncertain Future of the International Space Station: Analysis". Popular Mechanics. Archived from the original on 31 March 2009. Retrieved 6 March 2009. ^ a b "ISS Environment". Johnson Space Center. Archived from the original on 13 February 2008. Retrieved 15 October 2007. ^ "Rocket company tests world's most powerful ion engine". Newscientist.com. Retrieved 10 August 2017. ^ "Executive summary" (PDF). Ad Astra Rocket Company. 24 January 2010. Archived from the original (PDF) on 31 March 2010. Retrieved 27 February 2010. ^ "Press Release 121208" (PDF). AdAstra Rocket Company. 12 December 2008. Retrieved 7 December 2009. ^ "Propulsion Systems of the Future". NASA. Retrieved 29 May 2009. ^ David Shiga (5 October 2009). "Rocket company tests world's most powerful ion engine". New Scientist. Retrieved 7 October 2009. ^ a b "Exercising Control 49 months of DMS-R Operations" (PDF). ^ "Microsoft Word – hb_qs_vehicle_RussianUSGNCForceFight_pg1.doc" (PDF). Archived from the original (PDF) on 20 July 2012. Retrieved 1 May 2012. ^ "International Space Station Status Report #05-7". NASA. 11 February 2005. Retrieved 23 November 2008. ^ Carlos Roithmayr (2003). Dynamics and Control of Attitude, Power, and Momentum for a Spacecraft Using Flywheels and Control Moment Gyroscopes (PDF). Langley Research Center: NASA. Retrieved 12 July 2011. ^ Chris Bergin (14 June 2007). "Atlantis ready to support ISS troubleshooting". 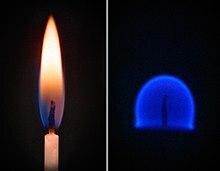 NASASPaceflight.com. Retrieved 6 March 2009. ^ Peterson, Liz Austin (30 October 2007). "Astronauts notice tear in solar panel". Associated Press. Retrieved 30 October 2007. ^ Stein, Rob (4 November 2007). "Space Station's Damaged Panel Is Fixed". The Washington Post. Retrieved 4 November 2007. ^ Harwood, William (25 March 2008). "Station chief gives detailed update on joint problem". CBS News & SpaceflightNow.com. Retrieved 5 November 2008. ^ Harik, Elliot P.; et al. (2010). The International Space Station Solar Alpha Rotary Joint Anomaly Investigation (PDF). 40th Aerospace Mechanisms Symposium. 12–14 May 2010. Cocoa Beach, Florida. JSC-CN-19606. ^ "Crew Expansion Prep, SARJ Repair Focus of STS-126". NASA. 30 October 2008. Retrieved 5 November 2008. ^ Harwood, William (18 November 2008). "Astronauts prepare for first spacewalk of shuttle flight". CBS News & SpaceflightNow.com. Retrieved 22 November 2008. ^ a b Bergin, Chris (1 April 2009). "ISS concern over S1 Radiator – may require replacement via shuttle mission". NASASpaceflight.com. Retrieved 3 April 2009. ^ "Problem forces partial powerdown aboard station". Spaceflightnow.com. 31 July 2010. Retrieved 16 November 2010. 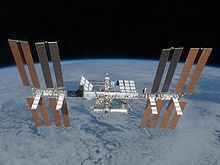 ^ "NASA ISS On-Orbit Status 1 August 2010 (early edition)". Spaceref.com. 31 July 2010. Retrieved 16 November 2010. ^ "ISS Active Control System". Boeing. 21 November 2006. Retrieved 16 November 2010. ^ Harwood, William (10 August 2010). "Wednesday spacewalk to remove failed coolant pump". Spaceflight Now. ^ Gebhardt, Chris (11 August 2010). "Large success for second EVA as failed Pump Module is removed". NASA Spaceflight. ^ Harwood, William (11 August 2010). "Station's bad pump removed; more spacewalking ahead". Spaceflight Now. ^ Bergin, Chris (18 August 2010). "ISS cooling configuration returning to normal confirming ETCS PM success". Spaceflight Now. ^ Chow, Denise (2 August 2010). "Cooling System Malfunction Highlights Space Station's Complexity". Space.com. ^ Harwood, William (31 July 2010). "Spacewalks needed to fix station cooling problem". Spaceflight Now. ^ Oberg, James (11 January 2004). "Crew finds 'culprit' in space station leak". MSNBC. Retrieved 22 August 2010. ^ Harwood, William (18 September 2006). "Oxygen Generator Problem Triggers Station Alarm". CBS News via Spaceflight Now. Retrieved 24 November 2008. ^ Harding, Pete (30 August 2012). "Astronaut duo complete challenging first post-Shuttle US spacewalk on ISS". NASASpaceFlight.com. Retrieved 22 October 2013. ^ Boucher, Marc (5 September 2012). "Critical Space Station spacewalk a Success". SpaceRef. ^ "Astronauts Complete Rare Christmas Eve Spacewalk". Leaker. Associated Press. 24 December 2013. Archived from the original on 26 December 2013. Retrieved 24 December 2013. ^ "Russian freighter arrives at International Space Station". Spaceflight Now. Retrieved 19 November 2018. ^ "Schedule". Orbital Velocity. Retrieved 19 April 2019. ^ a b "Soyuz crew enjoys problem-free launch, docks with space station". Spaceflight Now. Retrieved 4 December 2018. ^ "Space station crew back at six with successful Soyuz docking". Spaceflight Now. Retrieved 15 March 2019. ^ "Progress MS-11 docks to the ISS; Station supplies in good shape". NASA Spacefligt.com. Retrieved 4 April 2019. ^ "Schedule Launches, dockings, spacewalks, etc". Orbital Velocity. Retrieved 4 April 2019. ^ "Astronaut Commands Robotic Arm to Capture Cygnus Cargo Craft". BASA Blogs. Retrieved 19 April 2019. ^ "Schedule". Orbital Velociy. Retrieved 19 April 2019. ^ a b Berger, Eric (11 October 2018). "A Soyuz crew makes an emergency landing after rocket fails". Ars Technica. Retrieved 11 October 2018. ^ Foust, Jeff (11 October 2018). "NASA to look at options to keep crew on ISS while Soyuz grounded". SpaceNews. ^ Harwood, William (23 October 2018). "NASA administrator says Russians on track for December Soyuz flight to station". Spaceflight Now. Retrieved 25 October 2018. ^ Gebhardt, Chris (19 December 2018). "Soyuz MS-09 lands after unprecedented on-orbit repairs, inspections". NASASpaceFlight.com. Retrieved 11 January 2019. ^ Cooper, Ben (18 April 2018). "Rocket Launch Viewing Guide for Cape Canaveral". Launchphotography.com. Retrieved 20 April 2018. ^ Clark, Stephen (28 January 2019). "Launch Schedule". Spaceflight Now. Retrieved 8 February 2019. ^ "Запуск "Союза" к МКС перенесли по просьбе НАСА" [Soyuz launch to ISS was postponed upon NASA's request] (in Russian). RIA Novosti. 12 April 2019. Retrieved 13 April 2019. ^ a b c d e "Россия в 2019 году отправит на МКС семь космических кораблей" [Russia will launch seven spaceships to the ISS in 2019] (in Russian). RIA Novosti. 26 February 2019. Retrieved 26 February 2019. ^ "NASA, Partners Update Commercial Crew Launch Dates". NASA Commercial Crew Program Blog. 6 February 2019. Retrieved 8 February 2019. ^ a b Pietrobon, Steven (2 October 2018). "Japanese Launch Record (1966-present)". Retrieved 2 October 2018. ^ a b Johnson, Eric M. (20 March 2019). "Boeing delays by months test flights for U.S. human space program:..." Reuters. ^ a b c d Frommert, Hartmut (8 December 2018). "International Space Station Flight Schedule". Retrieved 10 December 2018. ^ a b c Pietrobon, Steven (19 January 2019). "United States Commercial ELV Launch Manifest". Retrieved 19 January 2019. ^ a b "Источник: Россия отправит к МКС семь кораблей и модуль "Наука" в 2019 году" [Russia plans to send seven spacecrafts and Nauka module to the ISS in 2019] (in Russian). RIA Novosti. 1 October 2018. Retrieved 2 October 2018. ^ a b c "Рогозин — РБК: "Формула "космос вне политики" не работает"" [Rogozin to RBC: The "cosmos out of politics" formula does not work]. RBC.ru (in Russian). 10 January 2019. Retrieved 12 January 2019. ^ Zak, Anatoly (27 March 2017). 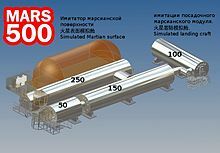 "Russian engineers tackle problems with MLM/Nauka module". Russian Space Web. Retrieved 28 March 2017. ^ a b c d e Pietrobon, Steven (8 February 2019). "Russian Launch Manifest". Retrieved 8 February 2019. ^ "ESA — ATV — Crew role in mission control". Esa.int. 2 March 2011. Retrieved 23 May 2011. ^ "ESA — Human Spaceflight and Exploration — International Space Station — Automated Transfer Vehicle (ATV)". Esa.int. 16 January 2009. Retrieved 23 May 2011. ^ Memi, Ed. "Space Shuttle upgrade lets astronauts at ISS stay in space longer". Boeing. Retrieved 17 September 2011. ^ Woffinden, David C.; Geller, David K. (July 2007). "Navigating the Road to Autonomous Orbital Rendezvous". Journal of Spacecraft and Rockets. 44 (4): 898–909. Bibcode:2007JSpRo..44..898W. doi:10.2514/1.30734. 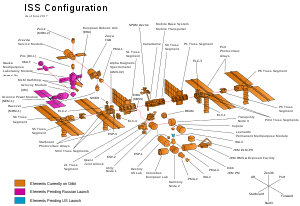 ^ "ISS EO-6". Astronautix.com. Archived from the original on 18 June 2012. Retrieved 1 May 2012. ^ "Live listing of spacecraft operations". NASA. 1 December 2009. Archived from the original on 3 August 2008. Retrieved 8 December 2009. ^ Space Operations Mission Directorate (30 August 2006). "Human Space Flight Transition Plan" (PDF). NASA. ^ "NASA Seeks Proposals for Crew and Cargo Transportation to Orbit" (Press release). NASA. 18 January 2006. Retrieved 21 November 2006. ^ "NASA proposes Soyuz photo op; shuttle launch readiness reviewed (UPDATED)". CBS. Retrieved 11 February 2011. ^ Chang, Kenneth (25 May 2012). "Space X Capsule Docks at Space Station". The New York Times. Retrieved 25 May 2012. ^ Trinidad, Katherine; Thomas, Candrea (22 May 2009). "NASA's Space Shuttle Landing Delayed by Weather". NASA. Retrieved 26 June 2015. ^ "ISS Crew Timeline" (PDF). NASA. 5 November 2008. Retrieved 5 November 2008. ^ "NASA – Time in Space, A Space in Time". www.nasa.gov. Retrieved 5 May 2015. ^ "A Slice of Time Pie". 17 March 2013. Archived from the original on 17 March 2013. Retrieved 5 May 2015. ^ "Human Space Flight (HSF) – Crew Answers". spaceflight.nasa.gov. Retrieved 5 May 2015. ^ "At Home with Commander Scott Kelly (Video)". 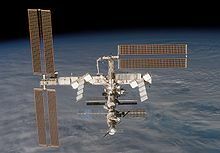 International Space Station: NASA. 6 December 2010. Retrieved 8 May 2011. ^ Broyan, James Lee; Borrego, Melissa Ann; Bahr, Juergen F. (2008). "International Space Station USOS Crew Quarters Development" (PDF). SAE International. Retrieved 8 May 2011. ^ a b c d e "Daily life". ESA. 19 July 2004. Retrieved 28 October 2009. ^ a b c d e f Mansfield, Cheryl L. (7 November 2008). "Station Prepares for Expanding Crew". NASA. Retrieved 17 September 2009. ^ a b c d "Living and Working on the International Space Station" (PDF). CSA. Archived from the original (PDF) on 19 April 2009. Retrieved 28 October 2009. ^ a b Malik, Tariq (27 July 2009). "Sleeping in Space is Easy, But There's No Shower". Space.com. Retrieved 29 October 2009. ^ Benson, Charles Dunlap and William David Compton. Living and Working in Space: A History of Skylab. NASA publication SP-4208. ^ Portree, David S. F. (March 1995). Mir Hardware Heritage (PDF). NASA. p. 86. OCLC 755272548. Reference Publication 1357. ^ Nyberg, Karen (12 July 2013). Karen Nyberg Shows How You Wash Hair in Space. YouTube.com. NASA. Retrieved 6 June 2015. ^ Lu, Ed (8 September 2003). "Greetings Earthling". NASA. Retrieved 1 November 2009. ^ Ker Than (23 February 2006). "Solar Flare Hits Earth and Mars". Space.com. ^ "A new kind of solar storm". NASA. 10 June 2005. ^ "Galactic Radiation Received in Flight". FAA Civil Aeromedical Institute. Archived from the original on 29 March 2010. Retrieved 20 May 2010. ^ Peter Suedfeld1; Kasia E. Wilk; Lindi Cassel. Flying with Strangers: Postmission Reflections of Multinational Space Crews. ^ Manzey, D.; Lorenz, B.; Poljakov, V. (1998). "Mental performance in extreme environments: Results from a performance monitoring study during a 438-day spaceflight". Ergonomics. 41 (4): 537–559. doi:10.1080/001401398186991. PMID 9557591. ^ "Behind the Scenes: The Making of an Astronaut". NASA. 23 August 2004. ^ Schneider, S. M.; Amonette, W. E.; Blazine, K.; Bentley, J.; c. Lee, S. M.; Loehr, J. A.; Moore, A. D.; Rapley, M.; Mulder, E. R.; Smith, S. M. (2003). "Training with the International Space Station Interim Resistive Exercise Device". Medicine & Science in Sports & Exercise. 35 (11): 1935–1945. doi:10.1249/01.MSS.0000093611.88198.08. PMID 14600562. 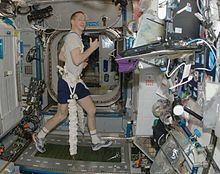 ^ "Bungee Cords Keep Astronauts Grounded While Running". NASA. 16 June 2009. Retrieved 23 August 2009. ^ Bell, Trudy E. (11 May 2007). "Preventing "Sick" Spaceships". NASA. Retrieved 29 March 2015. ^ "Mutant space microbes attack ISS: 'Munch' metal, may crack glass". RT. 23 April 2012. Retrieved 29 March 2015. ^ Korn, Anne (23 November 2018). 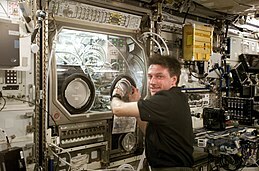 "ISS microbes should be monitored to avoid threat to astronaut health". Biomed Central. Retrieved 11 January 2019. ^ Singh, Nitin K.; et al. (23 November 2018). "Multi-drug resistant Enterobacter bugandensis species isolated from the International Space Station and comparative genomic analyses with human pathogenic strains". BMC Microbiology. 18: 175. doi:10.1186/s12866-018-1325-2. PMC 6251167. PMID 30466389. ^ Patrick L. Barry (2000). "Microscopic Stowaways on the ISS". Retrieved 29 March 2015. ^ BioMed Central (7 April 2019). "NASA researchers catalogue all microbes and fungi on the International Space Station". EurekAlert!. Retrieved 8 April 2019. ^ Sielaff, Aleksandra Checinska; et al. (8 April 2019). 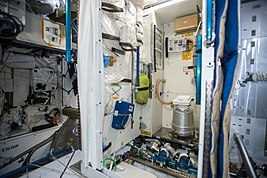 "Characterization of the total and viable bacterial and fungal communities associated with the International Space Station surfaces". Microbiome. 7 (50). doi:10.1186/s40168-019-0666-x. Retrieved 8 April 2019. ^ F. L. Whipple (1949). "The Theory of Micrometeoroids". Popular Astronomy. Vol. 57. p. 517. Bibcode:1949PA.....57..517W. ^ Chris Bergin (28 June 2011). "STS-135: FRR sets 8 July Launch Date for Atlantis – Debris misses ISS". 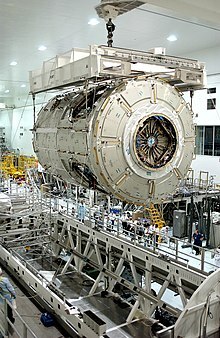 NASASpaceflight.com. Retrieved 28 June 2011. ^ "Space Suit Punctures and Decompression". The Artemis Project. Retrieved 20 July 2011. ^ "Microsoft PowerPoint – EducationPackage SMALL.ppt" (PDF). Archived from the original (PDF) on 8 April 2008. Retrieved 1 May 2012. ^ Rachel Courtland (16 March 2009). "Space station may move to dodge debris". New Scientist. Retrieved 20 April 2010. 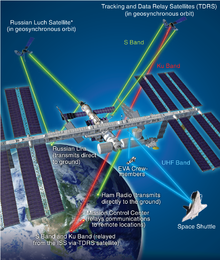 ^ a b "ISS Maneuvers to Avoid Russian Fragmentation Debris" (PDF). Orbital Debris Quarterly News. 12 (4): 1&2. October 2008. Archived from the original (PDF) on 27 May 2010. Retrieved 20 April 2010. ^ "ATV carries out first debris avoidance manoeuvre for the ISS". ESA. 28 August 2008. Retrieved 26 February 2010. ^ "Avoiding satellite collisions in 2009" (PDF). Orbital Debris Quarterly News. 14 (1): 2. January 2010. Archived from the original (PDF) on 27 May 2010. Retrieved 20 April 2010. ^ "ISS crew take to escape capsules in space junk alert". BBC News. 24 March 2012. Retrieved 24 March 2012. ^ "Station Crew Takes Precautions for Close Pass of Space Debris". NASA Blog. 16 June 2015. Retrieved 16 June 2015. ^ United Nations Treaties and Principles on Outer Space. (PDF). United Nations. New York. 2002. ISBN 92-1-100900-6. Retrieved 8 October 2011. ^ Kelly, Thomas (2000). 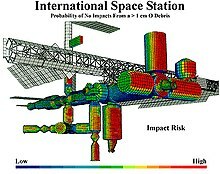 Engineering Challenges to the Long-Term Operation of the International Space Station. National Academies Press. pp. 28–30. doi:10.17226/9794. ISBN 978-0-309-06938-0. ^ a b "Tier 2 EIS for ISS" (PDF). NASA. Retrieved 12 July 2011. ^ a b Suffredini, Michael (October 2010). "ISS End-of-Life Disposal Plan" (PDF). NASA. Retrieved 7 March 2012. 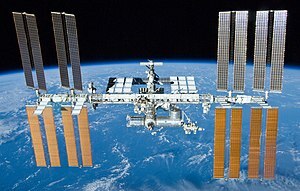 ^ "Russia to ban US from using Space Station over Ukraine sanctions". The Telegraph. Reuters. 13 May 2014. Retrieved 14 May 2014. ^ "From the earth to the moon, and then beyond – Technology & science – Space | NBC News". nbcnews.com. 20 July 2012. Retrieved 27 May 2014. ^ Boren, Zachary Davies (28 March 2015). 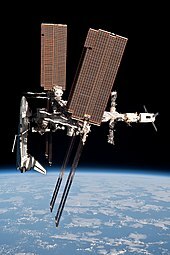 "Russia and the US will build a new space station together". The Independent. ^ "Russia & US agree to build new space station after ISS, work on joint Mars project". RT.com. 28 March 2015. Retrieved 28 March 2015. ^ "Russia announces plan to build new space station with NASA". Space Daily. Agence France-Presse. 28 March 2015. ^ Foust, Jeff (28 March 2015). "NASA Says No Plans for ISS Replacement with Russia". SpaceNews. ^ Maass, Ryan (30 September 2015). "NASA extends Boeing contract for International Space Station". Space Daily. UPI. Retrieved 2 October 2015. ^ "ISS' Life Span Could Extend Into 2028 – Space Corporation Energia Director". Sputnik. 15 November 2016. Retrieved 18 November 2016. ^ "Space Cowboys: Moscow to Mull Building Russian Orbital Station in Spring 2017". Sputnik. 16 November 2016. Retrieved 18 November 2016. ^ Cite error: The named reference nelson-20181020 was invoked but never defined (see the help page). ^ "Commercial space bill dies in the House". SpaceNews.com. 22 December 2018. Retrieved 18 March 2019. ^ Cruz, Ted (21 December 2018). "S.3277 - 115th Congress (2017-2018): Space Frontier Act of 2018". www.congress.gov. Retrieved 18 March 2019. ^ Foust, Jeff (27 September 2018). 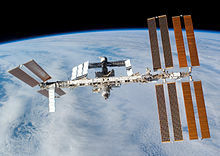 "House joins Senate in push to extend ISS". SpaceNews. Retrieved 2 October 2018. ^ Babin, Brian (26 September 2018). "H.R.6910 - 115th Congress (2017-2018): Leading Human Spaceflight Act". www.congress.gov. Retrieved 18 March 2019. ^ Zidbits (6 November 2010). "What Is The Most Expensive Object Ever Built?". Zidbits.com. Retrieved 22 October 2013. ^ Lafleur, Claude (8 March 2010). "Costs of US piloted programs". The Space Review. Retrieved 18 February 2012. See author correction in comments. ^ Price, Pat (2005). The Backyard Stargazer: An Absolute Beginner's Guide to Skywatching With and Without a Telescope. Gloucester, MA: Quarry Books. p. 140. ISBN 978-1-59253-148-6. ^ "Artificial Satellites > (Iridium) Flares". Calsky.com. Retrieved 1 May 2012. ^ "How to Spot the International Space Station (and other satellites)". Hayden Planetarium. Retrieved 12 July 2011. ^ NASA (2 July 2008). "International Space Station Sighting Opportunities". NASA. Retrieved 28 January 2009. ^ "ISS – Information". Heavens-Above.com. Retrieved 8 July 2010. ^ Harold F. Weaver (1947). "The Visibility of Stars Without Optical Aid". Publications of the Astronomical Society of the Pacific. 59 (350): 232. Bibcode:1947PASP...59..232W. doi:10.1086/125956. ^ "ISS visible during the daytime". Spaceweather.com. 5 June 2009. Retrieved 5 June 2009. ^ "Get notified when the International Space Station is in your area". 3 News NZ. 6 November 2012. Archived from the original on 12 October 2013. Retrieved 21 January 2013. ^ "Satellite Watching". HobbySpace. Retrieved 1 May 2012. ^ "Space StationAstrophotography – NASA Science". Science.nasa.gov. 24 March 2003. Retrieved 1 May 2012. ^ "[VIDEO] The ISS and Atlantis shuttle as seen in broad daylight". Zmescience.com. 20 July 2011. Retrieved 1 May 2012. 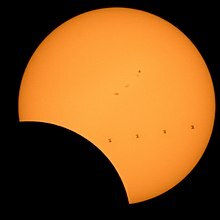 ^ "Space Station Transiting 2017 ECLIPSE, My Brain Stopped Working - Smarter Every Day 175". www.youtube.com. 22 August 2017. ^ Grossman, Lisa. "Moon and Space Station Eclipse the Sun". Wired. Reference Guide to the International Space Station (PDF) (Utilization ed.). NASA. September 2015. NP-2015-05-022-JSC. Reference Guide to the International Space Station (PDF) (Assembly Complete ed.). NASA. November 2010. ISBN 978-0-16-086517-6. NP-2010-09-682-HQ.